School breaks are always a bit of a challenge for our family. 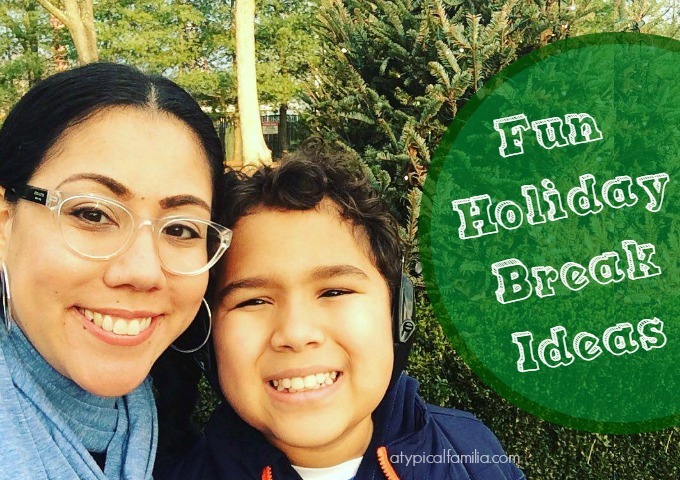 For kids with autism or any other special need, the holiday break is tough because they’re taken out of routine. And as a working mom, it leaves me scrambling for ideas. I want to keep my kid busy during the break, but I also want him to have fun. Clean Out the Toy Bins. A new year is upon us and I say: out with the old and in with the new. This is a great time to clean out bins and closets and reorganize your child’s room. Get your child involved in the task if you can. Make three piles: toss, keep and donate. I love donating Norrin’s toys to his school or therapists – especially if it’s an item that really helped Norrin. It’s also a great way to teach him about sharing. And it’s fun for Norrin because he likes seeing all of his toys – I allow him to help organize his room. Schedule a Play Date. With the holiday hustle and bustle winding down, schedule a play date – even if it’s just a quick meet up at the playground or library. We don’t do play dates often, but I’m hoping to squeeze at least one in over the next two weeks. A Special Outing. Is there a museum you’ve been wanting to visit? A movie you’ve been wanting to see? Maybe ice skating or a trip into the city? Go out and have an adventure! Take a chance and try something new with your child. Get Crafty. I am not a crafty mom. But I discovered Kiwi Crate and ordered a craft for Norrin. I love that the ‘crate’ comes with everything we need! But if you want to create your own, check out these cool ideas on PBS kids. Cookies & Hot Chocolate. What warms up a cold winter day better than freshly baked cookies and creamy hot chocolate?! My friend Ruby has some great cookie baking ideas and an amazing peppermint hot chocolate recipe. This is on the menu for this weekend for sure! Lazy Couch Potatoes. I love a lazy afternoon. I can’t wait to just snuggle on the sofa with Norrin watching movies, eating cookies and sipping hot chocolate. Work on a Skill. School breaks have their pros and cons but one of the pros is not having to rush in the morning. We’ll have time to get ready at our leisure and Norrin can work on dressing himself with little to no prompts. Over the break, I’ll bring Norrin into work with me. While we’re out of the apartment, we’ll work on independent public bathroom skills and safety skills – like crossing the street. I’ll make it fun by rewarding him for a job well done. Which means a trip to the LEGO store. What are your plans during the holiday break?